Do you toss and turn at night, unable to find a comfortable position? Are you relying on that first, second, or third coffee to get you through the day? Do you feel that no matter how many hours of sleep you get a night, you’re still exhausted during the day? We’ve all heard the old adage that the ideal sleep time is around 6-8 hours of sleep per night. But that means 6-8 hours of uninterrupted sleep. Sometimes there is nothing worse than a restless night, tossing and turning in bed unable to fall asleep, or constantly waking up throughout the night. A sleepless night like this can leave you groggy, irritable, effecting your concentration, your appetite, even your health, causing headaches and such. Around 40% of men and 20% of women snore, with 8% of the population suffering from sleep apnoea. Insomnia affects 20% of Australians and a further 18% suffer from restless legs. That’s a lot of people getting only a little sleep! Misalignment of the spine in our lower back or neck can often cause discomfort in bed. The inability to get comfortable in certain positions, pain or restlessness in the legs is usually due to lower back instability. While issues in your upper back or neck can cause discomfort with your pillow, it can also create tension in your neck and jaw restricting your airways. This can create problems such as snoring or sleep apnoea, as well as reducing oxygen to the brain, preventing you from being able to reach a proper REM sleep. Chiropractic care can help to alleviate these complaints and help you get better nights sleep. 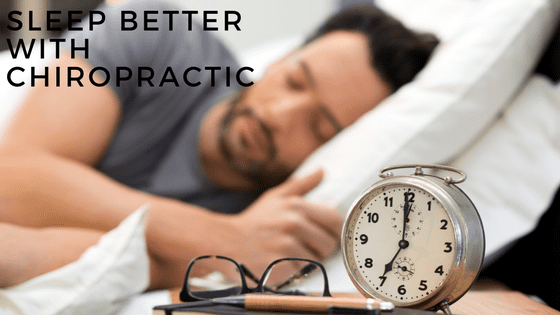 While Chiropractic can help you sleep better by alleviating those aches and pains that have kept you up all night, it can in fact do so much more! When we are stressed our bodies are in a state of fight or flight, with the stress hormone Cortisol running through our system like caffeine on high. Seeing your Chiropractor regularly and maintaining your spinal health helps to naturally lower these Cortisol levels. This leaves you feeling more at ease and relaxed, and better able to fall, and stay, asleep. By seeing a Chiropractor it won’t just help you get to some shut eye, but it could also improve the quality of your sleep! This can help improve your health, your energy levels and your life. To read more about some of the other benefits of Chiropractic click here.